After his first astonishing film My Idol with François Berléand and Diane Kruger, Guillaume Canet makes a striking come back with the thriller Tell No One adapted from Harlan Coben’s eponymous best seller. In his new film, Guillaume Canet once again commits himself both as an actor and as a director. But from a leading role in My idol, he passes to a subordinate role in Tell no one. Guillaume Canet admits that acting and directing at the same time is difficult and that having a minor rol e in Tell No One made it easier for him to focus on directing the film. Tell No One immerses you both in a love story and a police investigation marked by a breathtaking suspense. Is the main character, Alex Beck, a hero? Not exactly. Guillaume Canet precisely wanted an anti-hero for the actor embodying Alex, an ordinary man with no trouble and whose life is turned upside down the day his wife Margot is savagely murdered in mysterious circumstances eight years prior. Alex is a man like any other, facing his destiny when his life is moved by this sudden change. The feelings and emotions that keep him thinking about Margot are the same ones that will push him to try to find out about the truth. Eight years after her death he receives an e-mail from an unknown sender showing him his wife alive, filmed live. A simple text: “Tell no one” marks a turning point in Alex’s life. We had not seen such an amazing Francois Cluzet since Janis and John (2002). In Alex’s shoes, François Cluzet is making a huge comeback on top of the bill besides Marie-Josée Croze as Margot Beck. Guillaume Canet moved by the love story in Coben’s novel really wanted to give importance to it in the film in Alex and Margot’s couple. This is Francois Cluzet who keeps this feeling alive in Alex’s crazy search for his wife. For Tell no one, Guillaume Canet cast high-profile actors including Marie-Josée Croze, Francois Berléand (directed by Canet in My Idol), André Dussolier, Nathalie Baye ou Jean-Rochefort. Kristin Scott Thomas, already accustomed to French film sets, is Hélène Perkins, a close friend of Alex Beck. The British actress stays faithful to French directors by betting on the young actor/director Guillaume Canet. More surprising is the presence of some relatives or friends of the director such as his father Philippe Canet (Francois Beck), or his childhood friend Marina Hands (Anne Beck). This choice comes from Canet’s will to include in the film some autobiographic elements, such as the horse ridding world he knows since he's childhood . But Tell no one is not only a bunch of talented actors and a well imagined scenario. It is also a technical achievement. 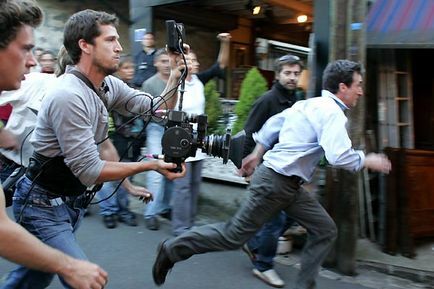 Guillaume Canet alternates hastily handheld camera shooted sequences for street pursuits and fix sequences for les dramatic scenes. The balance between steady and moving shots gives the film its particular aestheticism. The music is as brilliant as the shooting with Mathieu Chedid’s excellent soundtrack that perfectly matches the adventurous spirit of the movie. The young director has imagined characters anyone could identify with, places anyone could picture themselves in, an unbelievable story anyone could believe in… With Tell no one, Guillaume Canet makes Coben’s story a universal thriller and successfully gives a fresh breath to French cinema and the genre. A must seen movie that will embark you for two action pact and suspenseful hours!